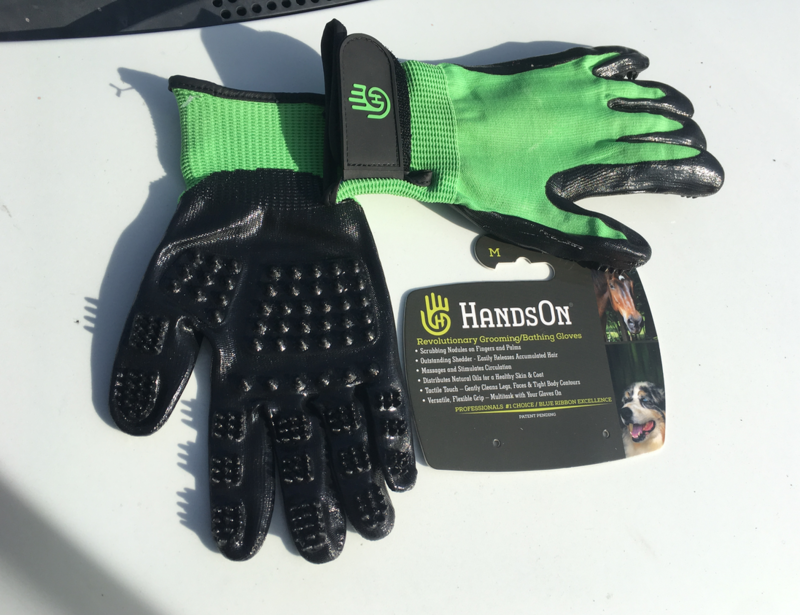 I saw these HANDS ON grooming gloves at the Western Horse Expo a few years ago. They had a prototype that wasn’t quite holding together, so at that time, I didn’t buy any… but then I heard that the new gloves were AMAZING. So… I bought a pair. 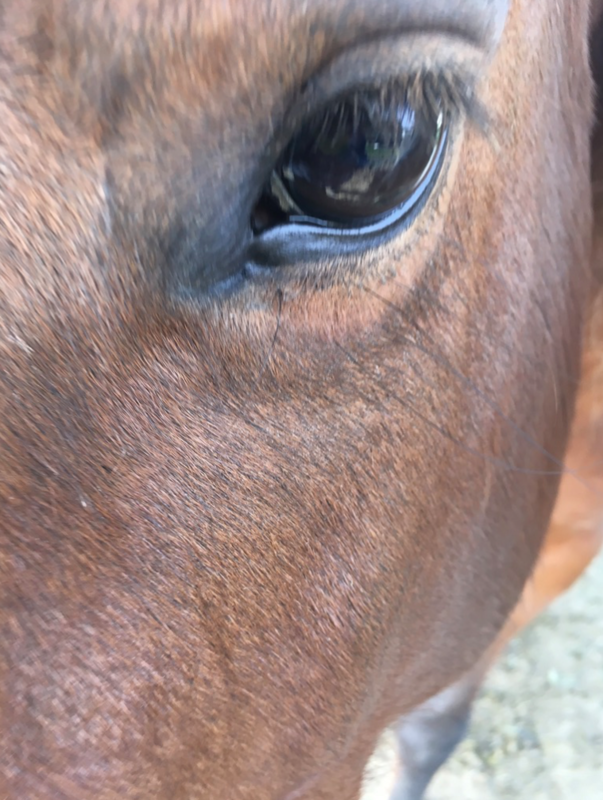 Wow!… If you haven’t tried them, give it a whirl – for your horse. Missy Miss and Mo (my test subjects) were practically falling over, they were so relaxed. Missy Miss would NOT let me stop. Mo even let me get the burrs out of his forelock! I got my gloves through Riding Warehouse! This is my set before I used them. DESCRIPTION: The gloves are relatively soft and mostly pliable. However, they are not like wearing a second skin. It takes breaking them in. The grooming spikes vary in size and length. The ones at the tips of your fingers are longer and spaced further apart – for accurate, soft digging and cleaning. Someone really thought about the design. That is evident. IT IS LIKE A BENDABLE BRUSH – because the brush part goes where your fingers go!! The palms have shorter, fatter spikes for massaging, which I found myself doing naturally. Of course, some areas of the horse need softer pressure than others. Missy Miss and Mo before we started. Mud balls, hoof cakes and messy. 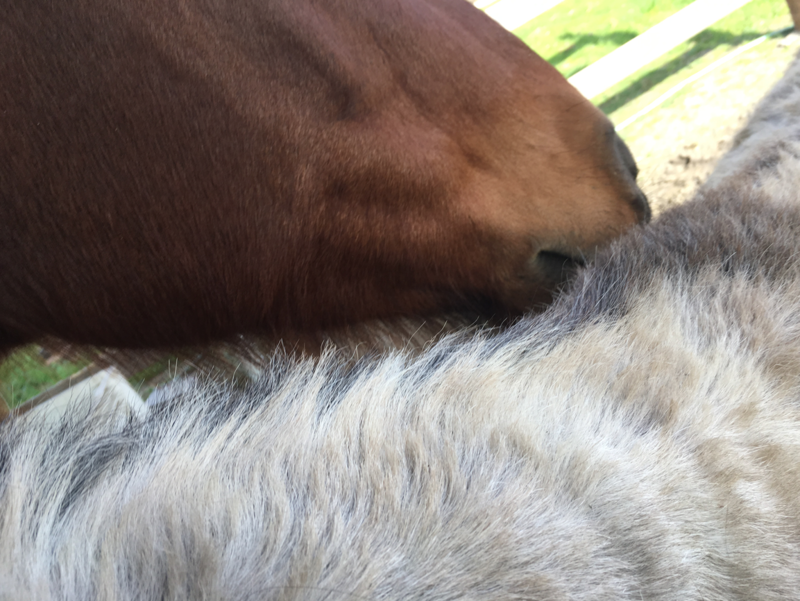 MY HORSES LOVED having their faces very gently combed. They loved it on their bodies and especially around the delicate ear area and leg areas. 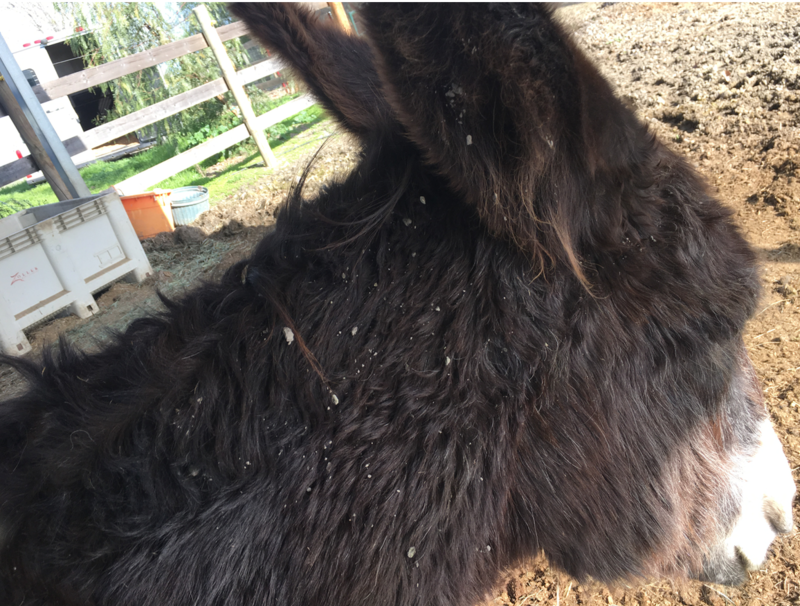 Mo never likes me to mess around by his ears, but he let me clean out all of the burrs with my index finger and the spikes. He loved it. 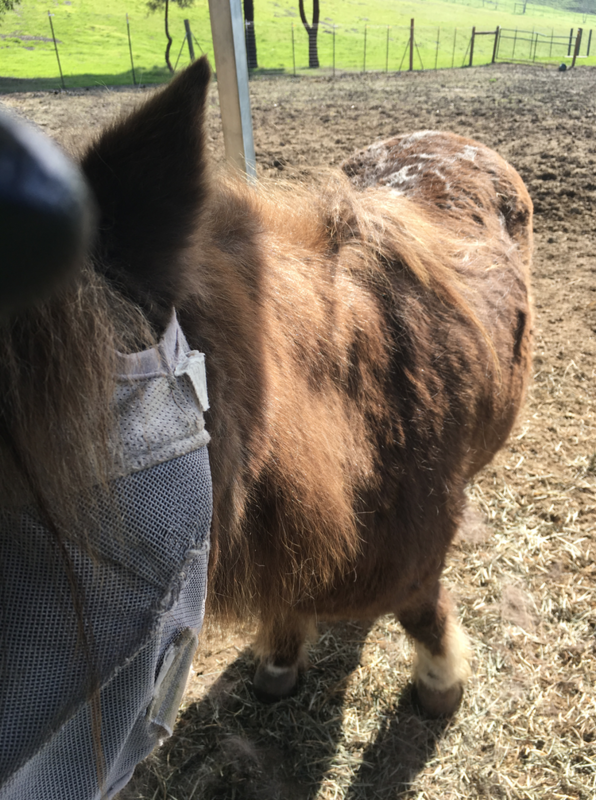 MUD BALLS: It took longer to break up the mud balls, but I also know that since I could ‘feel’ the pressure and pull, and therefore adjust that, the horses were more willing to hang out while I groomed the hardened mud. Mo usually hates any brush in this area.. but he loved these gloves! i got all the burrs out of there. Missy Miss hates to be touched anywhere above her eyes with a brush – she likes only fingers. But she let me use the Hands On glove – no problem. 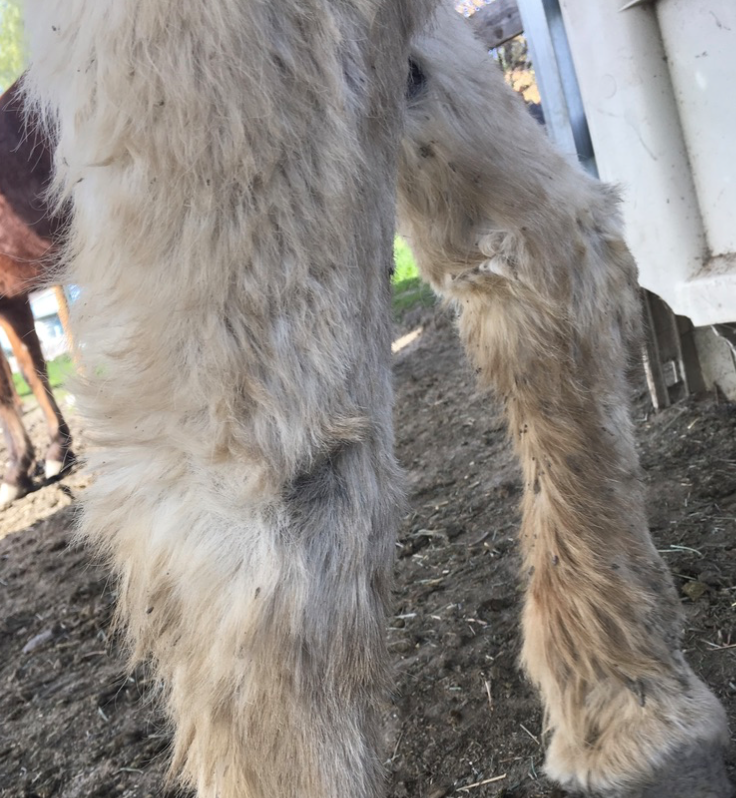 THE BEST area to groom is all around the legs, inner leg, pastern and behind the coronet band above the heel. 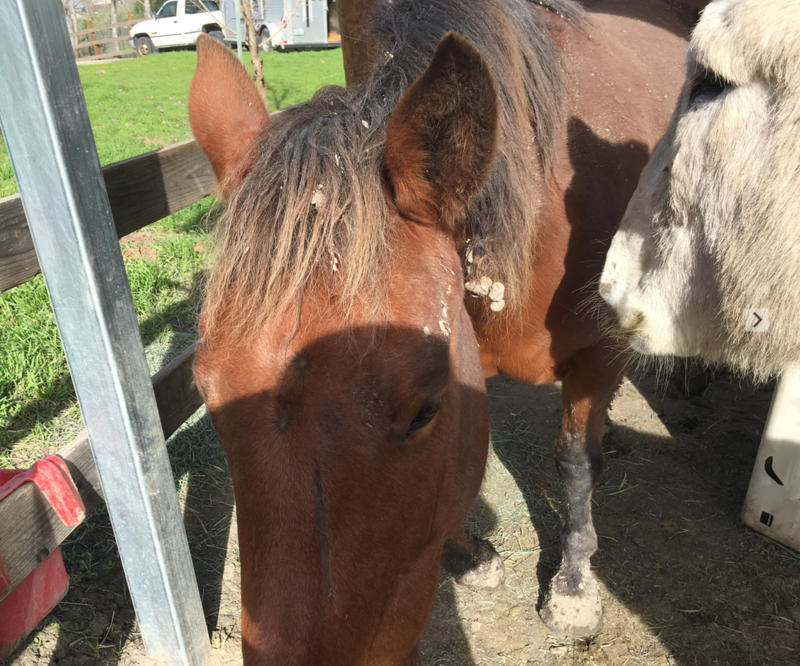 You know how all that dirt gets in there every day?… well, this whisked it all away while I massaged her leg/hoof. I was able to get all around their legs so easily – because it is like a bendable brush! It goes where your fingers go. So easy and they loved it. Also, they both loved under the throat/cheek/chin area. 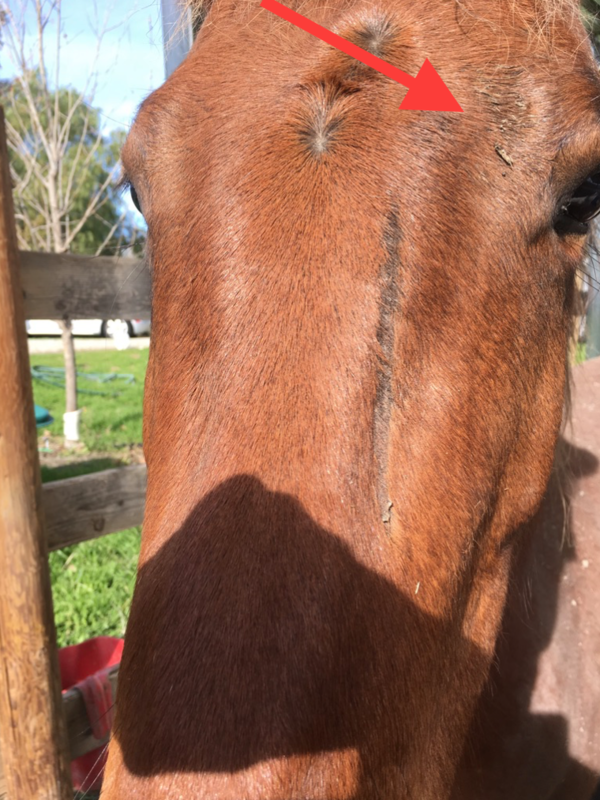 That inside spot that they cannot scratch themselves. I was able to get all around their legs so easily – because it is like a bendable brush! It goes where your fingers go. This is obviously a ‘before’ shot. MANES/TAILS… NOT SO MUCH. It doesn’t really work on hair. Well, that isn’t fair. 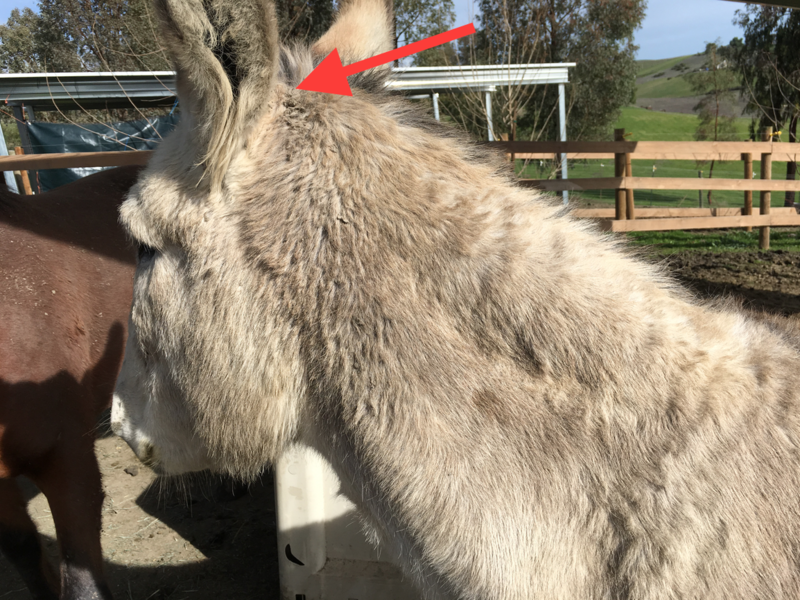 It worked on donkey hair, but donkey hair is much more thin, short and course than horse hair. It didn’t work well on horse hair – which is to be expected. It isn’t the right tool for that. All pretty. I used it on Mo’s mane, but not on hers. 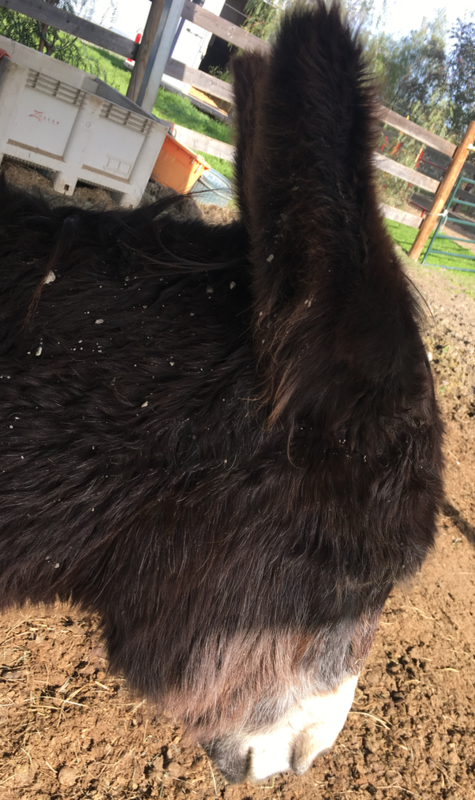 Donkey hair is much different than horse hair. RELAXATION FACTOR is amazing. I swear that they were in a trance. She kept almost falling over. He refused to move out of the grooming area. It isn’t as if they don’t already loved to be groomed, but I think it was like HITTING THE SPOT on your back or something. You know how you lean in when someone is scratching your back?… It was like that. They tried to both get groomed at once. I WOULDN’T only use these gloves. I think it is important to put your actual hands on your horse to feel them and feel for hot spots. There is nothing better than hands on horse. But, for grooming, these were a really fun and engaged way to groom. AND, my test subjects absolutely loved it. 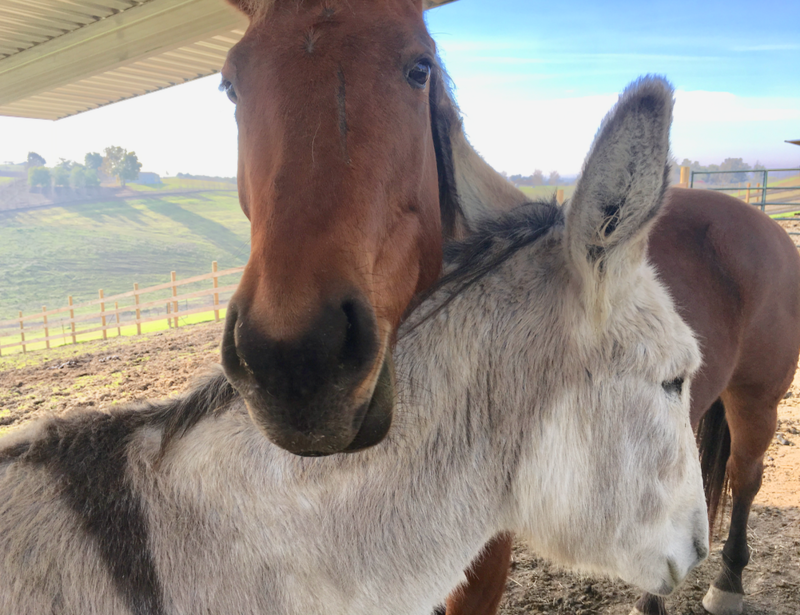 GRUMPY OLD MEN AND DONKS even like it! I didn’t have time to groom them fully, but I tried it on Dodger, and he didn’t move away. Dodger usually hates anything other than whisper soft. He’s 36, maybe he is more delicate, dunno. Anyway, he hung around! You can see that it also pulled loose hair – it is on the ground. Dodger, who hates being groomed, hung around! It pulled the loose hair onto the ground. And she immediately relaxed and dropped her head. She liked it. A HIT AND WORTH THE PURCHASE! I think these gloves are a handy item. They run true to size to maybe slightly larger, so don’t size up. Least expensive price was at Riding Warehouse! Search: Hands On Grooming gloves! I couldn’t get them off of me – they wanted MORE. Missy Miss is smiling. 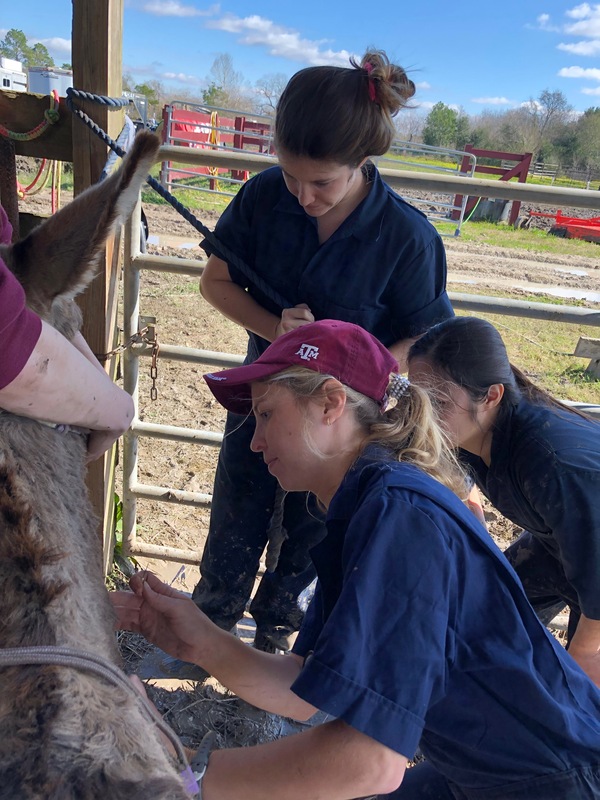 These donkeys lost their owner suddenly and had no one to come to their aid except Dr. Kris Anderson. 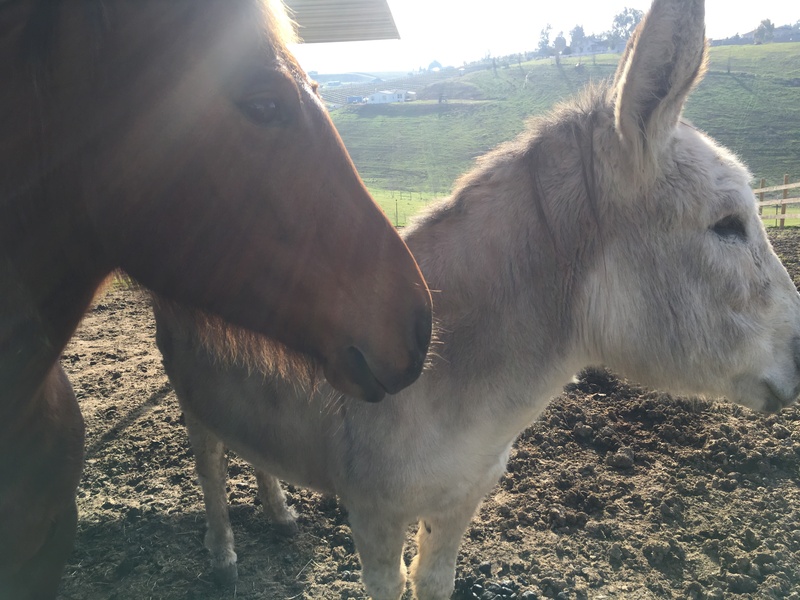 She brought them onto her personal property and had them gelded, teeth done, feet done, vaccines, meds, and gave them much needed nutrition. You can read their story here. Some Pros and Cons of Straight Load vs Slant Load Trailers – and Walk Throughs. 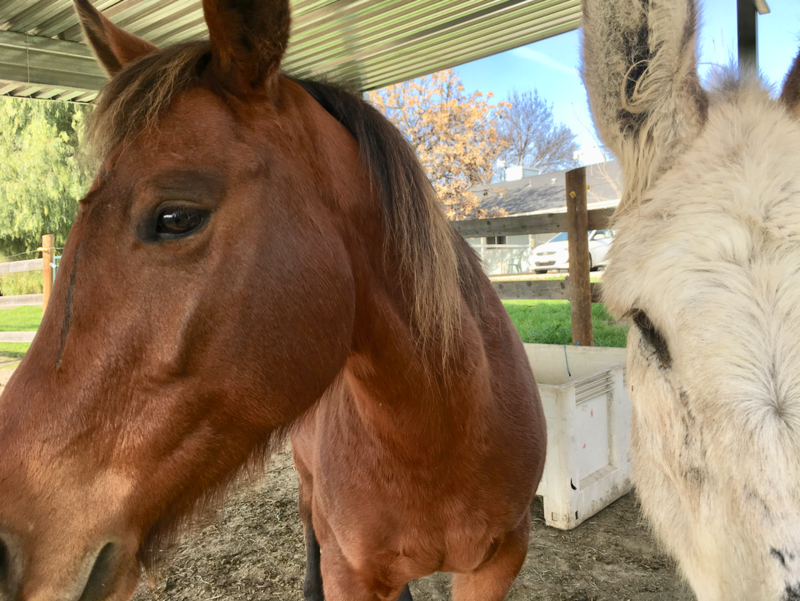 Beware of sink holes – and horses.